MassBike and WalkBoston are joining together to launch a free event, the 2012 Bike/Walk Summit. Now, the two organizations are reaching out to pedestrian and bike advocates as well as the State House to help to raise awareness about these important forms of transportation in the City of Boston. Every year, there are far too many pedestrian and bicycle accidents in Boston and elsewhere. As the warmer months roll in, it’s time to start campaigning for these vulnerable travelers once again. This year is an especially important year to send a strong message to our state senators and representatives that walking and biking should be top priorities in the city, since it looks like federal support is on the decline. Both WalkBoston and MassBike are asking you to RSVP today! It’s time to get Beacon Hill Moving. The event will be on the 17th of May from 10:00 a.m. to 1:00 p.m. at the Massachusetts State House, Nurses’ Hall. You’re asked to schedule a meeting with your senator or representative ahead of time. When you get there, safe biking and walking advocates will provide you with an information packet for both you and your government officials. You will also be given some key talking points regarding the current issues that are currently being discussed in the big house. When your meeting is adjourned, you’re asked to return to Nurses’ Hall to let your peers know how it went over some free lunch. 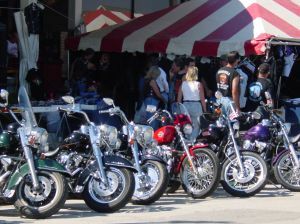 Our Boston injury attorneys understand that this event is being organized in the heart of the Bay State Bike Week! This week-long campaign is used to push awareness regarding bicycle travel. As a matter of fact, the state of Massachusetts is the only state in the country that has its own statewide bike week. That only makes sense considering the long history of biking in the area. In 2011, there were nearly 200 events during the campaign week. This year, safety advocates are hoping for more! Earlier this month, Bike Night: Beyond the Spandex, was held to raise awareness about bicyclists in the area. This event included a fashion show for cyclists, hors d’eouvres, cocktails and a lot of bike talk. The fashion show was to help to display some popular biking gear and to bring safe biking advocates together. Bikers were also entered into a raffle to win some great prizes, including bicycles from Giant and Specialized and a number of items from Mavic, Grey Goose Vodka, Hubway, Road ID, Sam Adams, Baily Works and more. It wasn’t only a chance for residents to get the hookup from local vendors and to win some great prizes, but it was also a chance for everyone to show their support for MassBike. As we head into Bay State Bike Week, biking advocates are urged to create and submit events to the community calendar. The more events we create the more awareness we can raise. Help to bring safe biking to the forefront and show your support today! If you or someone in your family has been injured or killed in a bicycle accident in Boston, Quincy Taunton or elsewhere in the state, contact Boston Injury Lawyer Jeffrey S. Glassman. Our law firm offers free and confidential appointments to discuss the rights of victims. Call 877-617-5333 to set up an appointment today.